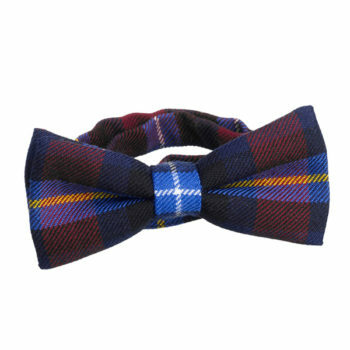 Suitable for formal and semi-formal occasions, this elegant bow tie is made for us in the Highland Titles tartan. The Highland Titles tartan bow tie is the perfect Scottish accessory for any occasion and gives you an opportunity to talk about your plot when asked about your tow tie’s tartan. Pre tied and made from 8oz wool tartan, woven in Scotland.